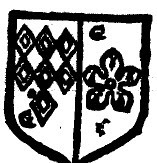 Since Saer de Quincy married one of the two heiresses of the de Beaumont family, he was entitled to bear the arms of the Beaumonts marshalled with his own. (Margaret’s brother, Robert de Beaumont, Earl of Leicester, died in 1204.) However, since Margaret was the younger sister, the title Earl of Leicester passed to her older sister’s husband. 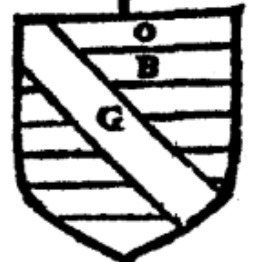 This was formerly the coat of arms of Herr von Angelach, a powerful noble in the region. Due to the similarity of “Angelach” and “Angelhaken” (fish hook), these appear to be canting arms. According to Ferne’s mouthpiece Paradius, de Gant was ennobled by William the Conqueror. (No exact date is given, but it seems likely this occurred before the compiliation of the Domesday Book in 1086.) Ferne does not mention that Gant was related to William the Conqueror, but his displeasure towards the newly created Norman nobles is palpable.